It’s a tribute to generations of people who never had the chance to experience their potential and a reminder to those of us who remain — and to those yet to come — that life is precious. That legacy etched in stone was placed in the cemetery on South Sandusky Street in 1998 by members of the Knights of Columbus Council 1056 and the Delaware Monument Company. Recently, a young man from Ostrander contributed his own heart and handiwork, sweat and grit to that legacy. Joe Reynolds, son of Ryan and Kim Reynolds, enhanced the memorial site by building a new bench and patio and placing a statue of the Virgin Mary alongside the black granite monument which overlooks the children’s section of the cemetery. He also added a bed of white rocks that surrounds the statue and monument. 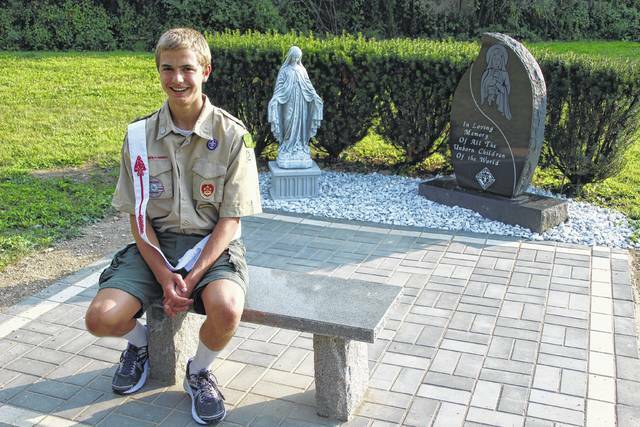 The 15-year-old Boy Scout from Troop 249 of the Simon Kenton Council — who is close to completing the requirements to become an Eagle Scout — said the idea was rooted in a previous visit to the cemetery. Ryan said the memorial site had fallen into disrepair in the 19 years since it was first established. So it was time for a change. “The old brick patio was sunken down. There was a concrete bench. It was broken and falling apart. It just didn’t last,” he said. The Reynolds family attends St. Mary Catholic Church in Delaware, so the chance to contribute something lasting to the parish and the community was important. Officials from St. Mary conducted a dedication service for the memorial on Aug. 26. Joe recruited “about 20” fellow Scouts to assist him with the project, but, as his dad said, “he did virtually all of it himself.” It took about three weeks to complete, Joe noted. Joe’s parents are proud of what their oldest son has accomplished. “Being out here and watching him build it and being in charge of the other Scouts who helped him and be in charge of the project — no adults can help him — it’s been amazing to watch his growth and see him take on a big project on his own,” said Kim. According to Ryan — who was an Eagle Scout in his youth — Joe is a highly motivated young man. Joe Reynolds sits on the bench he made for his Eagle Scout project. The new bench and patio of paver bricks as well as the statue of the Virgin Mary are new additions to a monument in memory of unborn children at St. Mary Cemetery in Delaware. The original monument, right, was placed by the Knights of Columbus Council 1056 and the Delaware Monument Company in 1998. Joe is the son of Ryan and Kim Reynolds of Ostrander. Contact Andrew Carter at 740-413-0900 and follow him on Twitter @DelOhioEditor.